Get plugged in to the clean energy revolution! 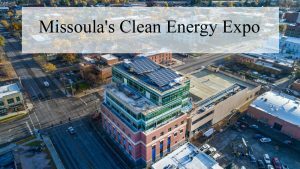 Climate Smart Missoula is excited to host the first annual Missoula Clean Energy Expo, Saturday, October 20, 2018, from 11:00 am to 3:00 pm at Caras Park. This free event will showcase local solar and renewable energy opportunities and businesses, energy efficiency, and other efforts that will help move our community to 100% clean electricity.